Have a great weekend, and welcome to summer. My interview with Bethanne Patrick of WETA’s (DC public television) author interview program The Book Studio. 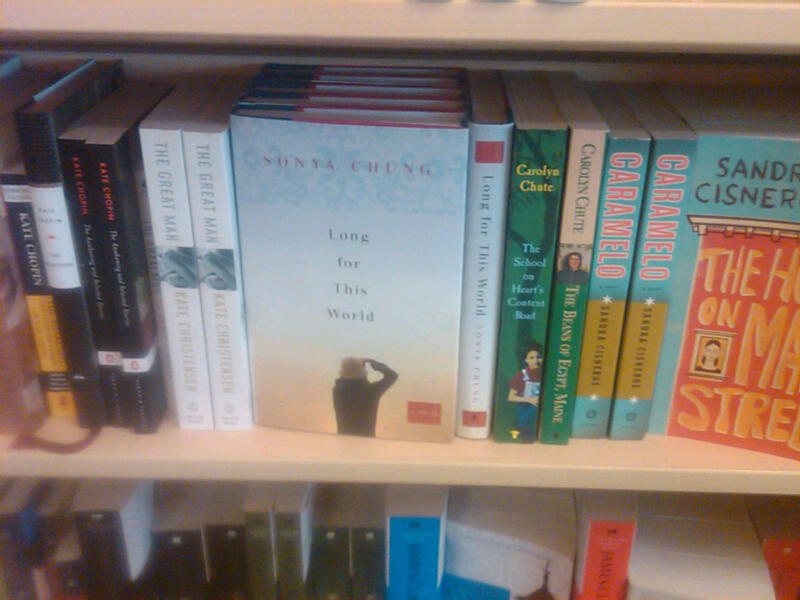 … for shelving Long for This World face-out in Syosset, and at the Madison Square Garden store. As I’ve been saying (probably too often), it’s a jungle out there for debut novelists; so every bit of support means a lot! One or two more will be added, possibly some of these exchanged. The working list is four times this length! Difficult, but fun, to choose. Today, I step up onto the soap box for a moment — hopefully we can all bear it and emerge the better for it. Here’s the zinger, folks: if you “wait for the paperback,” there is a pretty good chance there won’t be one. And if a publisher decides not to issue a paperback, this becomes an X-mark in the “no publish next novel” column for that writer. We spend money in this way, regularly, without a second thought. But a hard cover is “too expensive”? At a high-ranking major state university in California, a new policy has been instated, whereby instructors are forbidden from requiring students to purchase hard covers. Many students are funding their own educations, acquiring debt that will follow them for years into adulthood; I get this. Still, I question this institutional message about priorities. Food, shelter, clothing, transportation, health care. No arguments here. But what comes next? And doesn’t it matter? I am a middle-class person who has, at times, made a decent living and at other times made almost no living at all. I’ve done this with a partner and alone. I’m not someone who doesn’t understand that every dollar counts. And I’m not — let me be clear, since I’m someone who’s just published a novel — arguing for the pity purchase. I’m not saying buy the hard cover of a book you don’t really care about because the writer needs you to. I’m also not trying to convince anyone of the value of literature; I’m addressing this to the people who already claim to value literature. I’m saying, if you know this is a book you want to own, and that this is a writer whose long-term career you want to support, because you believe in the beauty and/or importance of this writer’s work and care about his ability to continue producing it; then buy the hard cover. For God’s sake. “Every vote counts,” I swear it does. I’ve been reading your feature essays over at Bookslut for some time now, so I’m writing you this fan letter. I’ve tried seeking you out in the typical web-stalking ways — Facebook, at Bookslut, etc. — to no avail. Good for you for minding your online privacy! 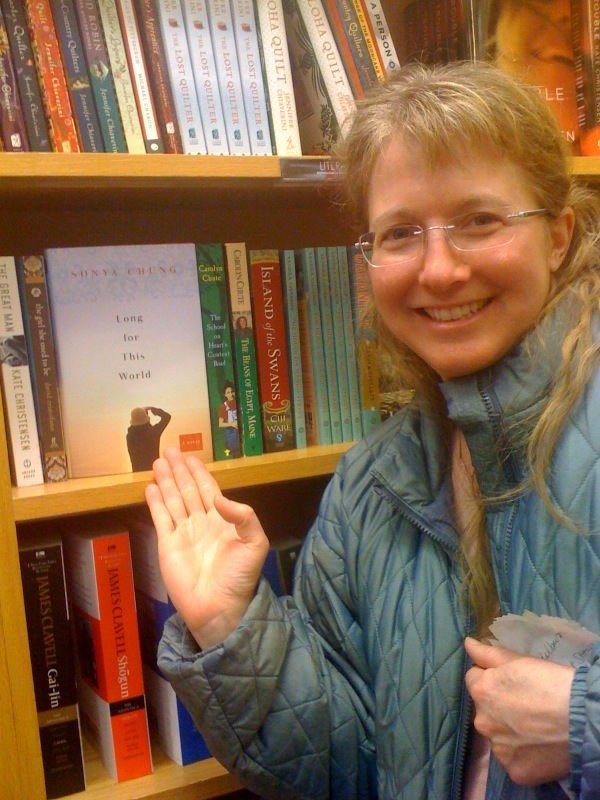 I even sent a review copy of Long for This World to you at Bookslut, care of Michael Schaub, which perhaps you received; no offense taken that it may be buried in a pile somewhere. Your March essay about Marilyn Monroe, play writing, Oscar Wilde, Jillian Weise, and David Mamet is terrific. I wanted to thank you for, essentially, reinventing the book review. I’ve always thought that the veneer of “objectivity” in book reviewing seemed odd, and unnecessary; I love that your “reviews” indulge your very personal experience of books, putting your responses and reactions into the context of a person’s (yours) life and literary journey, and synthesizing your thoughts and questions about a number of works at once. How else could it be? How else, after all, do we read? It must be strange to be an icon, even if that’s what you’ve chosen for yourself. Although, I guess in this world, of branding, of Facebook, of photo-retouching and plastic surgery and cybersex and virtual everything, we’re all icons, things instead of people, things instead of artists, and our art, if we have any, is a product, like our lives and bodies. Maybe the difference is that some people are good at being icons, and others mediocre. I don’t really need to be a famous playwright. But, I don’t want to be an image, or a thing. If you have to be a thing, instead of a full person, maybe it’s best to be a famous icon? This passage struck me as so insightful. To be a mediocre “brand” or icon just seems like a waste of time, and perhaps a recipe for unhappiness for an artist. With all the self-promotion we’re expected to do, one can fall into this trap. If you can make the branding work for you, at a high level, that seems probably worth it; otherwise… probably best to just get to work on the art itself. “Things” versus humans, the multiple-selves existence of artists (wonderful quote from Borges), mid-life reinvention, engaging in art with your whole body, solitary art-making versus collaboration — all ideas that swim around for me constantly. Thanks so much for exploring and synthesizing so compellingly. Good luck with your play writing. It’s a goal of mine as well — to write a stage play, but also to work on a project that has a collaborative element to it. I do think, however, that novels can be whole-body experiences, both for the writer and reader. The best fiction engages all the senses, I think; minds, spirits, and bodies, all cylinders firing. p.s. Haven’t yet read your piece on The Ecco Anthology, but look forward to it. p.p.s. You are the third person this month to mention/recommend The Picture of Dorian Gray; I’ll be getting on that this summer.